YouTube hosts large video streaming event. Earlier this month, YouTube hosted an annual awards and recognition event called ‘Broadcast’, which took place at the Hordern Pavilion (located within the grounds of old Sydney showground). Famous YouTube stars from channels such as My Cupcake Addiction and How To Cook That, were amongst more than 1000 guests in attendance. 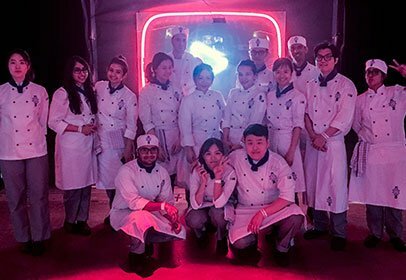 Le Cordon Bleu Sydney students were offered the opportunity to work alongside Pearl Catering, who were in charge of food and drink for the event. Pearl Catering is the preferred caterer for many of Sydney’s key event venues, and in recent times have been working closely with Le Cordon Bleu students who have proven themselves by demonstrating a high level of professionalism and skill when working in such fast paced environments. A total of 23 Le Cordon Bleu students assisted in the preparation, plating, and service at the awards ceremony, coming from a varied skill levels ranging from Basic to Superior, and even a few of our Bachelor students who expressed an interest in “getting their hands dirty”! And for those students who participated and performed exceptionally well, they were offered the opportunity to continue on with Pearl Catering, after being hired as a casual employee.